Does the sun shining into the oceans result in more heat energy being captured for a considerably longer time than on land surfaces? It seems logical to me since the short waves penetrate deeper and when converted to heat, don’t get re-radiated immediately like with a surface black body. If the above is true (maybe not), I don’t understand why solar intensity variations, even if relatively small would not have a significant effect on OHC over a period of time such as a year. Likewise, if there was a period with lower sun intensity or an abnormal amount of cloud cover over much of the oceans, wouldn’t the OHC go down? Follow-up to my previous post. Wouldn’t the OHC go down if there was an unusual amount of cloud cover or reduction in sun intensity because latent heat transfer to the atmosphere and long wave radiation from the ocean surface would continue but less sun radiation reaches the ocean to replenish the OHC? Follow-up to my previous post. 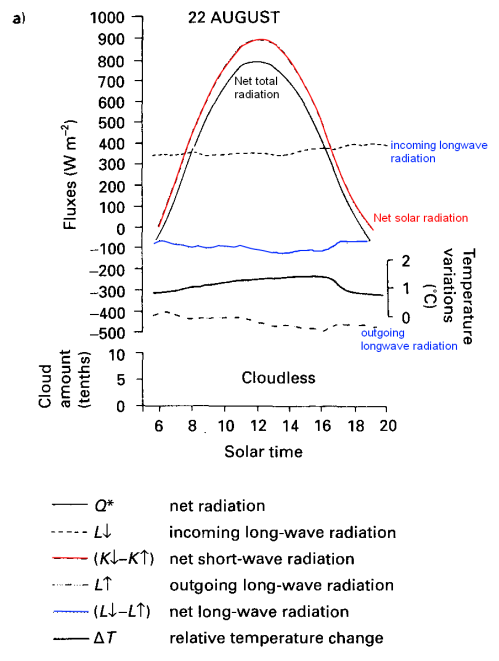 Wouldn’t the OHC go down if there was an unusual amount of cloud cover or reduction in sun intensity because latent heat transfer to the atmosphere and long wave radiation from the ocean surface would continue but less sun radiation reaches the ocean to replenish the OHC? Until it reaches equilibrium again? How much energy is used in generating the wind and clouds? Nit-picking – you mean the square root of 10, surely? Thickness penetrated is proportional to the square root of diffusivity times time, for simple heat conduction. Conduction in cases of turbulent/convective fluid flow may not follow the same sort of relationship. Presumably the numbers vary from day to day, and by time of year. Can we guess by how much? Sensible heat includes wind bring heat from other places. The asymmetric and lagged profiles of the 10-15C temperature curve are worth noting. Is the shape always the same? Is the midpoint of minimum and maximum equal to the mean? The lag is only a couple of hours, here. 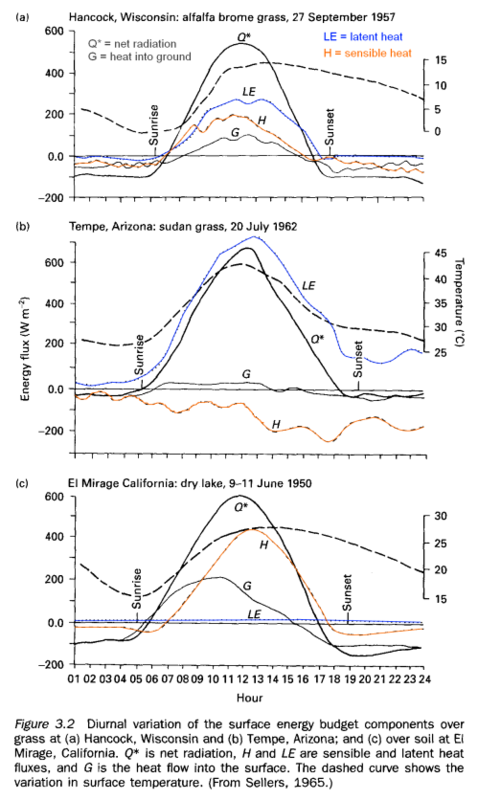 The plots are shown against time presumably to highlight the relationship with insolation, and how temperature depends on heat flow. But there is also a strong dependence of flow on current temperatures with results in a strong feedback effect. Heat flow depends on temperature, too. When you cut things with a laser, the smoke or vapor needs to be blown away for the beam to reach the surface. This is a huge problem that has to be managed. Pulsing the laser can be done if continuous quick removal be difficult. Otherwise you heat the cloud and the energy doesn’t get to the workpiece. Clouds matter. Not nitpicking at all, you are correct, over-simplifying is not good and I have updated the post. On your other question, these are typical profiles but every case is different. Due to feedbacks and other atmospheric conditions, including lateral movements of heat and availability of water. The spectral absorption of a photon that raises an orbital electron to a higher state does NOT cause the molecule to become hotter. The logic cascades like a clockwork now. I’d like to learn more about this. I vaguely remember the classes where I learned the absorption and emission of energy related to electrons changing orbitals. But this story seems to be about energy causing vibrational modes. And I think a “hotter molecule” means simply a “faster molecule”. I don’t understand why solar intensity variations, even if relatively small would not have a significant effect on OHC over a period of time such as a year. Likewise, if there was a period with lower sun intensity or an abnormal amount of cloud cover over much of the oceans, wouldn’t the OHC go down? OHC would go down. The question is by how much. The oceans have a huge heat capacity, therefore, the value would be usually “insignificant”. Take a look at Radiative Forcing, Thermal Lag and Equilibrium Temperatures for some idea of the timescales involved. And take a look at the data I linked to in the comments in that post, and the temperature range over which surface water temperature varies within a year. 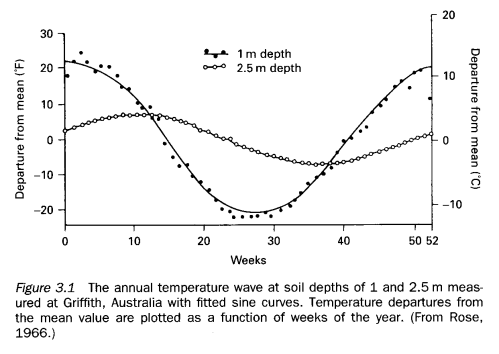 You could calculate the depth of water this rate of change corresponds to, and hence how far (roughly) the annual temperature change penetrated. Longer term changes can penetrate further, but there is a time-power trade-off here. The longer you wait, the more thermal capacity you have access to, but the slower the change of heat content and hence the lower the power that can be absorbed. I am looking forward to scienceofdoom’s next instalment on this. Doing the work of making clouds, supporting clouds aloft, and pushing air around takes energy. No mechanism operates without loss of energy in the process of doing its work. How much energy is utilized in moving things around in the atmosphere? 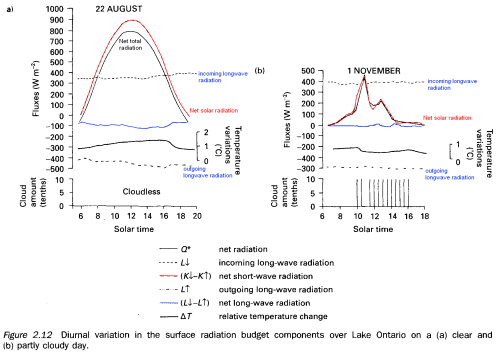 The radiance plot you are referring to (Fig 2.12 from Robinson 1999) is of measurements taken over water (Lake Ontario), not land as you state. The plot you show is interesting in and of itself as it reveals that the downwelling IR doesn’t heat the water because it is exceeded by the upwelling IR, with a negative net IR. The same goes for land, as can be seen in the plot I linked to. Interesting. Brego: Of course the downwelling IR doesn’t heat the surface. The dominant source of energy input to the Earth’s surface is solar (ie visible) radiation during the day. In fact, downwelling IR from GHGs could never *actually* heat the surface of any planet – after all, it’s only backscatter from IR that the planet itself is emitting in the first place! What it can do is reduce the rate of heat *loss* from IR emission, which results in a warmer planet because the planet keeps more of the heat input it gained from the sun. Not necessarily. GHGs collide with other molecules and acquire energy, which they can then radiate. It’s perfectly possible for sensible heat to conduct into N2/O2 molecules at the surface, for these to rise by convection, collide with some H2O molecule (say) at altitude, and for that to emit. Likewise, upwelling photons may be absorbed by CO2 or H2O which can lose the energy by collision with other molecules. At altitude, it tends to be convection that controls the local temperature. In the final graph above, all the lines approach the same gradient. The best example I know of to illustrate the effect of downwelling radiation is the fact that it is warmer on cloudy nights. In the case of clouds, much of this is the consequence of the process of latent heat and sensible heat movement from the surface. Heated air near the surface expands and so its density is reduced, so it therefore rises. At a certain height (dependent on a number of factors) the water vapor condenses, releasing heat which tends to cause the air to keep rising. Thank you. That sounds like a great deal of work. Moving air is not easy. The work done in expanding the air “causes” a loss of heat (change in temperature). This relationship is expressed mathematically under the 1st law of thermodynamics (conservation of energy). I hope to cover it to some level in another post explaining the temperature structure of the troposphere. Thank you. I look forward to reading the link and to reading your take on it as well. The numbers show that in any volume of atmosphere that contains 1% water vapor, the water component does hundreds of times more work moving heat from surface to space than all the other molecules of all the other gases in that volume combined- and sometimes thousands of times more – cirrusly. Water has a phase change just to become gas which requires almost 500 times more heat than CO2 can do. The release of energy on freezing is about 3000 times. All the other molecules are bit players in the refrigeration cycle. With respect to downward radiation or reflection, as Nullius in Verba remarked – on a cloudy night, you feel the warmth. On a clear night, all the other molecules sit on their thumbs pretty much and ride along. the speed of a nitrogen molecule at room temperature is just about 1000 mph. And if I recall, 1% water vapor by volume would be considered rather dry. LED lighting- electrons hopping shells – colored light. Heat is served on the side. The upward IR would be expected to be higher than the downward IR. The sun warms the surface, the surface heats up and radiates (and conducts, convects and evaporates into) the atmosphere. The atmosphere radiates energy according to its temperature and emissivity – but it is colder than the surface. And so, on average, it will radiate less energy to the surface than the surface is radiating to it. “Doesn’t heat the water“? What do you mean exactly? The water would be cooler if this downward radiation did not occur. The net heat transfer is from the warmer surface to the colder atmosphere. (The real second law of thermodynamics is intact). Or were you making another point? on April 14, 2010 at 4:38 am | Reply NickB. Great post – bookmarked for future reference! This is the part where I rhetorically ponder what this means for the 61,000 square miles of pavement we’ve put down in the US. I will also mention, in passing of course, that much of the land surface is covered with plants which means they shade the soil from direct solar gain. Those are, however, conversations for another day – and this is a great foundation for future discussions here or elsewhere. on April 14, 2010 at 2:09 pm | Reply NickB. Sorry – one additional thought/question: Is there a similar post here describing ocean behavior. I was pondering this in static the other day about how visible light will penetrate – relatively well – the sunlit zone down to 600+ft, and much less well the twilight zone down to 3300ft. I guess I had never thought about it before, but – in the static – that warming will be stable with no convection since the lower you go the less light (warming) it gets. Of course, the ocean is rarely calm/flat as implied by my static analysis, and cooling from the top layer interacting with the atmosphere will cause convection in most (all?) situations. Anyway… just curious if this was already out there. 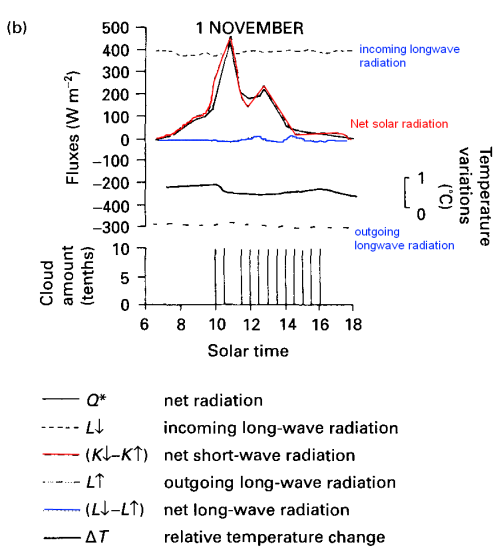 You might be interested in the link a few comments above to the post on radiative forcing, thermal lag, etc. I think more is supposed to be coming on that topic. As regards the winds, there is an as-yet unmentioned ‘energy source’ – the Coriolis force. Most winds – as compared to micro-meteorological effects – are the result of air moving between between high pressure and low pressure zones. This occurs of quite large scales and the resultant movement is directly subject to coriolos forces. What you see is the isobars on the weather map (lines of equal pressure) also map very closely to the wind direction. The closeness of the isobars maps directly onto the wind-speed. The closer the isobars, the faster the wind blows. What would be a relatively gentle flow of air from high pressure to low pressure is accelerated by the coriolis force and travels at right angles to the nominal flow direction at a speed related to the pressure difference over distance. I’m not sure of the exact physics of this process, but I expect (scienceofdoom ?) that there is energy transfer from the earth’s rotation into the movement of air. In effect a slight frictional effect.on the earth’s rotation – or at least a complex momentum transfer. I follow most of what you write but I’m a little confused about one point (well one more than others…lol). Reading through your posts it seems that CO2 emits IR at the wavelength that it was absorbed…..my understanding, that has been reinforced by other subjects where IR comes into play, is that the emmission wavelength is defined by the temp of the body be it a solid or gas. Putting this together with info from your posts seems to imply that CO2 can only ever be one temperature and this is surely not right! Is there a chart of CO2 and other gases emmission spectra that you can refer me too? Reading through your posts it seems that CO2 emits IR at the wavelength that it was absorbed…..my understanding, that has been reinforced by other subjects where IR comes into play, is that the emission wavelength is defined by the temp of the body be it a solid or gas. CO2 emits IR according to temperature and the wavelengths at which it can emit (and absorb). The concept is first that a blackbody radiates according to the Planck function and secondly that this is modified by the emissivity as a function of wavelength. So let me know where you found the misleading idea and I will try and make it clearer – or fix it if it’s just incorrect. Putting this together with info from your posts seems to imply that CO2 can only ever be one temperature and this is surely not right! Is there a chart of CO2 and other gases emmission spectra that you can refer me too? Correct, this is not right. On a clear day at high noon in July in Atlanta there is roughly 4 times as much greenhouse gas (water vapor) in the air as there is at the same time in Phoenix, AZ. On a clear day both cities get about the same amount of solar radiation (same latitude) and both are at the same altitude. But Phoenix is MUCH hotter than Atlanta (even at night, for those folks who believe in the “cold desert night” myth). With four times as much water vapor in the air in Atlanta, shouldn’t there should be four times as much “back-radiation” from the water vapor in Atlanta? If so, why doesn’t it get hotter? You can blame evaporation for robbing energy from the system, but at a given instant, there should still be about 4 times as much “backradiation” in Atlanta, so that a blackbody should get much hotter. But it doesn’t What is the deal? Intriguing question. So far I’m not sure there’s enough data to work out the answer. Where is the air blowing from for both cities? What is the humidity profile up through the atmosphere – i.e., not just at the ground? Perhaps Atlanta is more humid because it has more ocean air, whereas the air is blowing in from the desert for Phoenix. This would mean that Phoenix is getting hotter air from the desert while Atlanta is getting cooler air from the ocean. Another guess might be that Atlanta has more humidity because there is more surface moisture (unlikely in Atlanta, lots of concrete but I don’t know for sure, only been there a couple of times) – more surface moisture keeps the surface cooler as the energy all goes into evaporating the water rather than – in the case of Phoenix – in heating the surface instead. I think the first guess is more likely – do you have any more data on the two situations? I think you put some things very well, especially #105. The psychology of how people come to believe things is quite fascinating..
It’s a good question. I thought it best to let scienceofdoom have a go first, but now that he has, I’ll make my suggestion. Soden and Held discuss the mechanism of the greenhouse effect in simple terms. If you read the section on pp446-447 above and below figure 1, you will see that a major factor in the amount of heating that will result is the lapse rate. If you also know that the lapse rates for dry and moist atmospheres are different, does that offer a possible explanation? heh- sure works for me. NV: Although lapse rates are, indeed, different, I don’t see how that applies to my question. Is there more “backradiation” when there are more GHGs (in Atlanta) or not? If there is, then the hood of my car should get a lot hotter in Atlanta than in Phoenix (but it doesn’t). If there is not more backradiation, then I fail to see how Soden and Held’s little diagram makes sense. If there is more surface humidity only there will probably not be a noticeable difference in backradiation. 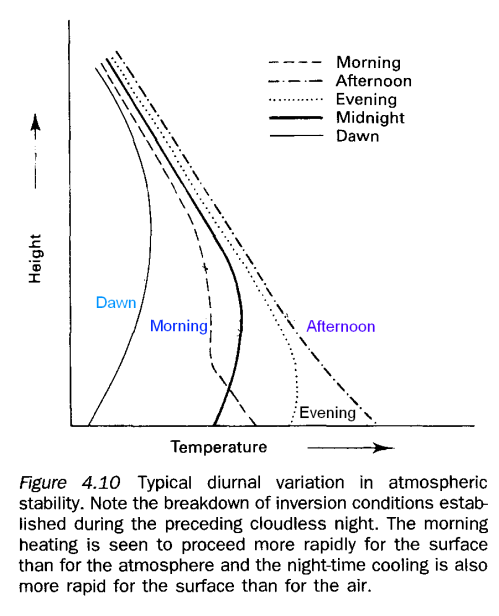 If there is higher humidity through a significant vertical profile then there will be higher backradiation (see note). But this is only one factor in determining the temperature, as you can see with the variation in all parameters in the examples above. -Is colder air blowing in from the ocean? -Is warmer air blowing in from the desert? Do you see that more than surface humidity needs to be known? Note: to be more complete, radiation from the atmosphere depends on the temperature profile of the atmosphere at least up to the tropopause (around 10km), as well as the concentration of the various trace gases. This is because radiation is proportional to the 4th power of temperature, and the emissivity of the atmosphere. The point is that back radiation has nothing to do with it. The amount of back radiation just increases or decreases the amount of convection required to maintain the fixed lapse rate. It is the lapse rate that controls surface temperature. That’s why I let scienceofdoom answer first – because I was planning to give an explanation that I knew conflicted with his. It would be impolite. There are two mechanisms by which the greenhouse effect can work – the non-convective ‘layers’ or ‘shells’ model, and the convective lapse-rate model developed originally by Manabe and Wetherald. The usual approach to teaching it starts with the shell model as the basic mechanism, and then tries to introduce convection as a minor modification to it. This I believe to be wrong. The effects of convection so dominate the result that it is in effect a completely different mechanism, and the intuition developed for the shell model is just misleading. But it persists, nevertheless. All the language about heat being ‘trapped’, upwelling longwave being absorbed, and downwelling ‘backradiation’ are relevant to the shell model. But they don’t have much relevance to the real atmosphere. Such things do happen, and are symptoms of warming, but they don’t really affect the surface temperature much unless convection is stopped. In a convective atmosphere, the surface temperature is controlled by the incoming energy, the average altitude of emission direct to space, and the lapse rate between that altitude and the surface. The atmosphere at the average emission altitude settles at the effective radiative temperature (as any radiating body in a vacuum does), and then as air descends to the surface from that altitude (driven by convection) it is compressed by rising air pressure, and the compression increases its temperature. The higher the altitude it descends from, the warmer the surface gets. So in Atlanta the average altitude of emission to space is a bit higher than it is in Phoenix due to the extra H2O in the air, so air descending from this altitude has further to go and is compressed more. But at the same time, moist air changes temperature with altitude more slowly than dry air, so the two effects tend to cancel. This doesn’t apply to CO2, which doesn’t affect the lapse rate at sensible concentrations, and so its effect is purely warming. But water is complicated stuff. To be perfectly honest, I don’t actually know if the differing lapse rate is enough to overcome the effect of the higher emission altitude – I was rather hoping that one of the experts here would be able to confirm or contradict – but it seems a reasonable hypothesis to put forward. Another possibility is that it is related to the reason Phoenix is dry. This occurs in bands where the convective circulation of a Hadley cell descends to the surface again. It’s dry because all the water was squeezed out of it when it rose in the tropics. But it’s also warm, being the mechanism by which heat is transported from equator to poles. Atlanta may be on the same latitude, but the divergence zones don’t follow latitude lines exactly anyway, and evidently Atlanta isn’t subject to the same circumstance. People are often so fixed on the solar input at the surface, they forget all about the horizontal convection of heat from the tropics as another source of heat. There could be all sorts of other reasons too. But I saw in the above explanation an excellent opportunity to ram the point home once more. Back radiation isn’t the correct explanation for the greenhouse effect. Very nice of you to think like this. But no need. If you have something to say, go ahead and say it. In fact, I prefer being second, that way I can make less mistakes.. The usual approach to teaching it starts with the shell model as the basic mechanism, and then tries to introduce convection as a minor modification to it. I’ve never heard of the “shell model” – perhaps it goes by different names in different places? I’ve been through a reasonable number of atmospheric physics books and the convective model has been the only one presented for the temperature profile in the troposphere. Can you explain this shell model? I’m part way through writing an article about the basics of the troposphere – that will be another opportunity to discuss this subject. The first half of your explanation seems reasonably uncontroversial, but that depends on whether I’ve really understood what you are saying. You have mentioned intriguing comments a few times, such as “back radiation isn’t the correct explanation for the greenhouse effect” but I don’t know exactly what you think is the real explanation. If it’s what you gave earlier, that sounded like the standard radiative-convective model. On the second part – I need to think about it some more before I can comment. On any given day in any given place equilibrium conditions can be assumed not to apply so that does make we wonder about it. I now see the “shell model” in your other post on Stratospheric Cooling. I have seen this, but never as the basis for establishing the temperature profile in the lower atmosphere. Sometimes I have seen it used as a thought experiment to help “illuminate” the radiative equilibrium – which, as you correctly point out, can’t be maintained in the troposphere. When I first came across it, it was called the ‘layers’ model (sometimes the ‘isothermal layers’ model), but I noticed that in the comments to Gavin’s post linked by Alexandre on the Stratospheric Cooling thread I noticed they called it ‘n-shells’, and it reminded me of somebody referring to these sorts of models as ‘shell models’ once before a long time ago. I thought it was a better and more descriptive name. I was trying to be precise about what I said: there’s only one model of the lower atmosphere, but there are two mechanisms used to explain ‘the greenhouse effect’. People using the shells model usually don’t go into details about the actual atmosphere. There are a lot of phrases commonly used in explanations that clearly refer to the shells approach. In particular, heat upwelling from the surface hits the bottom shell, which absorbs it and radiates it back. The radiative equilibrium mechanism makes this back radiation the cause of the surface being hot. As far as I’m concerned, the convective lapse-rate version is the standard, perfectly orthodox version of the greenhouse effect that is implied by the maths used by scientists when they’re doing it for real. It is the mainstream view. But when they’re explaining it to a general audience, lapse rates and convection are commonly not mentioned at all, and it is all about radiation, trapping of longwave absorbed by GHGs, and this heat being radiated back to the surface. That’s a perfect description of the shell model. And then a huge amount of confusion is caused and time wasted as people with little access to the technical literature try to fit numbers to what they’ve been told and, in various ways, find they can’t get it to work. Like Atlanta vs Phoenix. It seemed to me that the convective lapse rate was fundamental to the explanation with internal radiation being a subsidiary complexity/modification/exception, rather than the other way round as it was usually presented. It confuses the public, and after reading the Gavin post, it appears it confuses the scientists too. NV: Thanks. Finally a mechanism that makes sense to me! I was wondering if the latent heat loss from a moist soil (which keeps it’s surface cooler than a dry soil) has much impact on the amount of energy that it radiates back out to space. And as a consequence I was wondering if more rainfall would tend to lead to a warmer world (other things being equal) ? Thanks for direct to this post. Regretfully, I now have more questions that answers. 1. Would you kindly explain the relationship between “sensible” heat, and temperature as measured by a weather monitoring station? 2. Would you kindly explain why incoming longwave radiation appears (in the first 4 graphs) to be constant. Is there some mechanism that stores LWR in the atmosphere that accounts for the apparent continuous release? Artigo muito bom, tudo o que eu tenho que saber está aqui! Science of Doom, I came across this interesting thread late unfortunately. The key point is that in the troposphere the effect of more green house gas on temperature is canceled by an increase in convection so that thermodynamic equilibrium is maintained. Therefore, we must first analyze what happens in the tropopause and above. There is almost no water vapor there, so a water vapor feedback may not exist. There could be some cloud feedback because increased convection could promote cloud formation. This article doesn’t really cover that particular case at all. However, we have looked at the effect of doubling CO2 in much detail – at least “pre-feedback” – for example, in Visualizing Atmospheric Radiation – Part Seven – CO2 increases. While convection – all other things being equal – maintains the same lapse rate, the emission to space must take place from a higher altitude (with more GHGs). Higher altitudes are colder so the emission of radiation from the climate system is reduced. The subject of the emission height to space from the atmosphere is considered in Visualizing Atmospheric Radiation – Part Three – Average Height of Emission. Take a look and feel free to comment on those articles.